Who says a better world is impossible? Cars, air travel, space exploration, television, nuclear power, high-speed computers, telephones, organ transplants, prosthetic body parts… At various times these were all deemed impossible. I’ve been around long enough to have witnessed many technological feats that were once unimaginable. Even 10 or 20 years ago, I would never have guessed people would carry supercomputers in their pockets — your smart phone is more powerful than all the computers NASA used to put astronauts on the moon in 1969 combined! Despite a long history of the impossible becoming possible, often very quickly, we hear the “can’t be done” refrain repeated over and over — especially in the only debate over global warming that matters: What can we do about it? Climate change deniers and fossil fuel industry apologists often argue that replacing oil, coal and gas with clean energy is beyond our reach. The claim is both facile and false. Facile because the issue is complicated. It’s not simply a matter of substituting one for the other. To begin, conservation and efficiency are key. We must find ways to reduce the amount of energy we use — not a huge challenge considering how much people waste, especially in the developed world. False because rapid advances in clean energy and grid technologies continue to get us closer to necessary reductions in our use of polluting fossil fuels. It’s ironic that anti-environmentalists and renewable energy opponents often accuse those of us seeking solutions of wanting to go back to the past, to living in caves, scrounging for roots and berries. They’re the ones intent on continuing to burn stuff to keep warm — to the detriment of the natural world and all it provides. People have used wind and solar power for thousands of years. But recent rapid advances in generation, storage and transmission technologies have led to a fast-developing industry that’s outpacing fossil fuels in growth and job creation. Costs are coming down to the point where renewable energy is competitive with the heavily subsidized fossil fuel industry. According to the International Energy Agency, renewable energy for worldwide electricity generation grew to 22 per cent in 2013, a five per cent increase from 2012. The problem is that much of the world still burns non-renewable resources for electricity and fuels, causing pollution and climate change and, subsequently, more human health problems, extreme weather events, water shortages and environmental devastation. In many cities in China, the air has become almost unbreathable, as seen in the shocking Chinese documentary film Under the Dome. In California, a prolonged drought is affecting food production. Extreme weather events are costing billions of dollars worldwide. Relying on market capitalism encourages hyper-consumption, planned obsolescence, wasteful production and endless growth. Cutting pollution and greenhouse gas emissions requires conserving energy as well as developing new energy technologies. Along with reducing our reliance on private automobiles and making buildings and homes more energy-efficient, that also means making goods that last longer and producing fewer disposable or useless items so less energy is consumed in production. People have changed economic systems many times before, when they no longer suited shifting conditions or when they were found to be inhumane, as with slavery. And people continue to develop tools and technologies that were once thought impossible. Things are only impossible until they’re not. We can’t let those who are stuck in the past, unable to imagine a better future, hold us back from creating a safer, cleaner and more just world. 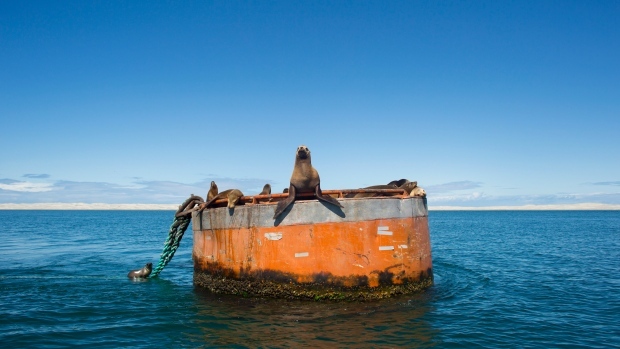 A group of California sea lions rest on a large buoy in the San Ignacio lagoon. Sea lion pups and seabirds are being affected by a warming Pacific Ocean, according to the Southwest Fisheries Science Center in the U.S. Starving sea lion pups and seabirds up and down the U.S. West Coast this year may be part of a large-scale shift of the Pacific Ocean to warmer and less productive conditions, according to a newAmerican federal fisheries report. The National Oceanic and Atmospheric Administration presented the findings on the warming Pacific in an annual report on the state of the waters off California. “We are in some ways entering a situation we haven’t seen before,” Cisco Werner, director of the Southwest Fisheries Science Center in La Jolla, Calif., said in a statement from NOAA. The situation demands that scientists consider the impact on ocean life as a whole, Werner said. From 2014, waters off Southern California and the Gulf of Alaska turned significantly warmer than usual. The so-called “warm blobs” have grown to cover most of the West Coast, making for record-high water temperatures. Tiny, energy-rich organisms that support the West Coast food chain have suffered in the warming water, the report said. Discoveries of large numbers of emaciated young sea lions off California and starving seabirds off Oregon and Washington may reflect dwindling nourishment overall as the Pacific warms, the study said.